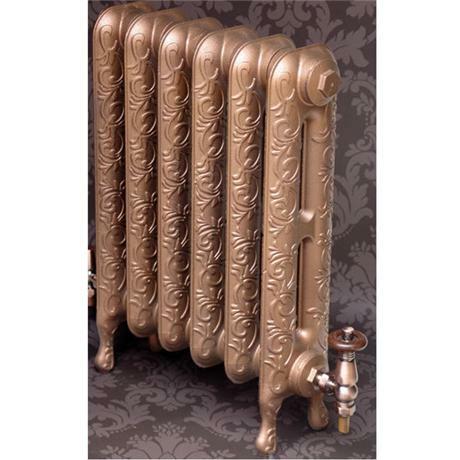 An elegant cast iron radiator echoing a bygone era. The Kensington is a very stylish cast iron radiator and is a popular choice for the traditional refurbishment, new build, barn or warehouse conversion seeking an authentic traditional appearance. This radiator is beautifully etched with a scroll like design which flows throughout its length. The Kensington is a free standing radiator and is available in 580mm, 750mm and 780mm heights. The Kensington range from Paladin is available in several different size and colour options, the range comes as standard in a primed black finish. The radiator can then be painted by you or you can choose from the manufacturers choice of colour options. The product pictured is the H580mm x W461mm (6 section) model with Antique Gold finish. This product is custom Manufactured specifically for each customer order, Due to the vast variety of sizes and finishes available pricing is on application. The prices displayed on each product are applicable for that sized radiator in standard Primed Black finish Only. Below - Example of manufacturers available metallic finishes, Manufacturer will Mix any Colour on request, Price on Application. Purchased two of these for our bathroom revamp revamp, went on holiday while they were being fitted and wow they look the business. Extreemly happy with my purchase!